More M&A consolidation in the business rule engine (BRE) market is coming. There are a few small vendors (new and existing) with unique and technology that could be very interesting to the larger players. 2006 saw Mindbox and Versata get acquired. Insession Technologies spun off Resolution EBS. 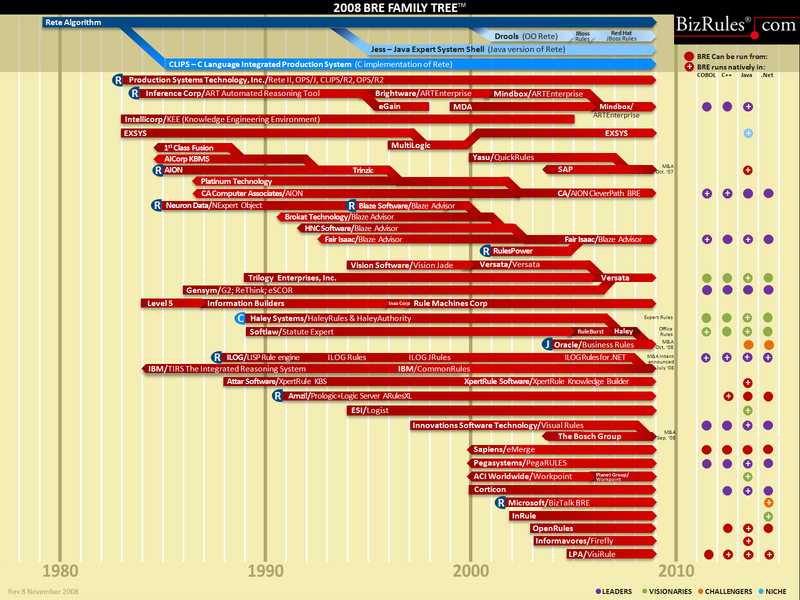 See the 2007 BRE Family Tree for who the leading vendors are today and how they got there. Look for Microsoft to play a larger role in the BR market, one that helps legitimize the space for those that still don't get BR. Microsoft already has 2 BRE technologies embedded in larger offerings. Yet because it doesn't market these rule engines as separate products yet, they are still pretty much under the radar. One of their BREs is embedded in Vista, so by the end of 2007 thousands maybe millions of client desktops will have a BRE rule execution engine ready to fire rules. More small BRE vendors will partner with Microsoft and position their BRE engines as a powerful rule authoring tool, integrate their product with Microsoft BRE, and position MSFT BRE as the runtime rule engine. A couple of BRE vendors are already doing this. An interesting possibility. Look out for alliances between between enterprise architecture (EA) modeling tools and business rule management systems (BRMS) as customers demand more integration with modeling tools and BR tools. As the BR approach gets blessed and accepted by more and more IT shops, BR modeling with play a larger role. Customers moving to this new BR approach and technology will continue to create business rules center of excellence, as I predicted last year. 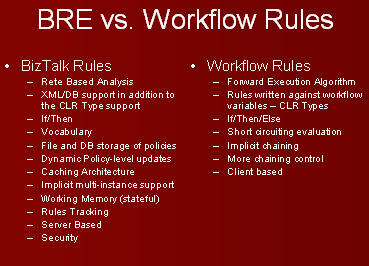 Business Rule Engine (BRE) products will become more and more similar. Selecting the right engine will get harder and become more important as the products get more powerful. BRE sales people are still spending a lot time selling the idea and concept of BR, and wasting too much time looking for the business case to make the sale. Smart customers are already sold on the BR idea. They're not even wasting time putting together the "business case" for using a BRE. They realize they need a BRE and they need it now. A rulebase (rule engine), IT and the Business is quickly discovering, is now just as necessary as a database. So forget the business case for "why the customer needs a BRE". Let's talk instead about "why the customer should buy your BRE". Renewed focus on rule harvesting and rule development methodologies. At the end of the day if you don't know what your business rules are, or if you don't modernize your rules before storing them in a BRE, it won't matter what BRE you select. Some companies don't want to bother buying an (BRE) engine. They want to buy the whole car. Look for rule-based packages that OEM a BRE for specific decisioning and advising solutions to become available. Finally, what I think is the most powerful business rules trend of all: Question Answering. According to Matthew Glotzbach, head of products for Google Enterprise, "Question answering is the future of search". This "new" technology is really a nod back to the classic interactive question answering expert system. You've probably run a Microsoft Wizard to troubleshoot a hardware problem. With a BRE under the hood, and a new marketing label: Expert system, Wizard, whatever, you shall now be called question answering... The marketing gods make it so... well now it looks like the next generation of search will leverage the power of the underappreciated and misunderstood expert system. Fair Isaac came out with SmartForms last year - basically they added in the feature they took out when they went from expert system to business rule engine: the smart interactive question answer front end. Haley is doing the same thing. I'm beginning to realize that when these expert system vendors renamed themselves as business rule engine vendors, what they really did was take out the smart interactive question answer interface. You know, the one where depending on the user's answer, the rules determine the next question to ask the user. Microsoft is beta-testing Microsoft Live QnA. Google is working on QnA as well. BIZRULES is working on the Question Answering Smart Banner Ad. Expert systems are back! Vendors are going to jump on the bandwagon and call their FAQ products question answering solutions. The real QA software will have at least two attributes: interactive and intelligent. Don't be fooled: a static FAQ page is not a Question Answering solution. James Taylor and friends at Fair Isaac have put together a great list of predictions for the business rules market for 2007 over here and here. I agree and like a lot of these predictions. The more predictions the better. Let's keep it moving, and have fun ruling your business in 2007! I discovered David Strommer's blog about .Net and Enterprise Architecture recently.